Healthcare providers today face the challenge of delivering up-to-date, evidence-based care given the ever burgeoning pool of medical evidence, which is not only prone to inconsistencies but also take an average of 17 years to make their way into routine clinical practice. 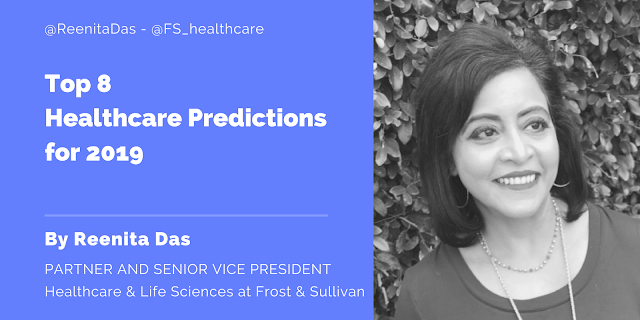 Coupled with the hassle of meeting advance electronic health record (EHR) platform integration requirements, Dr. Rao proposes that buying knowledge-based CDSS is increasingly more favorable and the way forward. A number of major initial and ongoing hurdles with home-grown solutions – including the significant time and effort needed to constantly update evidence – could overwhelm and overburden healthcare organizations, taking time away from delivering standardized and evidence-based care. Dr. Rao offers five ways on how these challenges can be avoided with the purchase of third-party CDSS platforms. Care that is important is often not delivered. Care that is delivered is often not important1. The importance of clinical care grounded in a reliable evidence base cannot be over-emphasised. Evidence-based care processes, supported by automated clinical information and decision support systems, offer the greatest promise of achieving the best outcomes2. Proprietary Clinical Decision Support Systems (CDSS) built on evidence-adaptive platforms incorporating clinical knowledge that continually reflects current EBM gleaned from both the research literature and sources of practice expertise will soon outgrow self-synthesised (home-grown) solutions. This paper explores this process. Clinical practice is full of contradictions, not only where individual professional experiences conflict, but even where “evidence” partially or completely disagrees. The primary reason for these inconsistencies is that evidence is dynamic and emergent, never constant. Evidence can often be incomplete, with varying levels of quality and strength of recommendations3. Keeping up with latest evidence and eliminating its inconsistencies is quite an arduous task and carries the inherent risk of practicing outdated medicine (with occasional catastrophic consequences). Given such realities of evidence-based medicine, one must consider: is the business of extrapolating evidence something providers and healthcare organisations are willing to do on their own? It has been estimated that greater than two million articles are published in the biomedical literature each year4. If a physician were to attempt to keep up with this literary explosion by reading two articles each day, at the end of one year, that physician would be more than sixty centuries behind! If physicians were to read everything of possible clinical relevance, they would need to read around 6,000 articles a day! Compounding this problem is the conundrum of diffusion. “Diffusion” is the spread of best (research) evidence on managing diseases and symptoms to the patient bedside5. According to conventional wisdom, it takes an average of 17 years for validated clinical research findings to make their way into routine clinical practice6. In an age where global public health emergencies (like the recent Zika virus outbreak) require “knowledge hyper-loops” for rapid diffusion of knowledge into general practice, the 17-year latency needs to be radically shortened to 17 hours or even less. Clinical Decision Support Systems (CDSS) have been described as the Computerised Patient Record (CPR) System’s Crown Jewel7. According to Gartner’s CPR generations (Fig 1), CPRs or Electronic Health Records (EHRs) have had an increasingly positive impact over the last few decades in reducing medical errors. 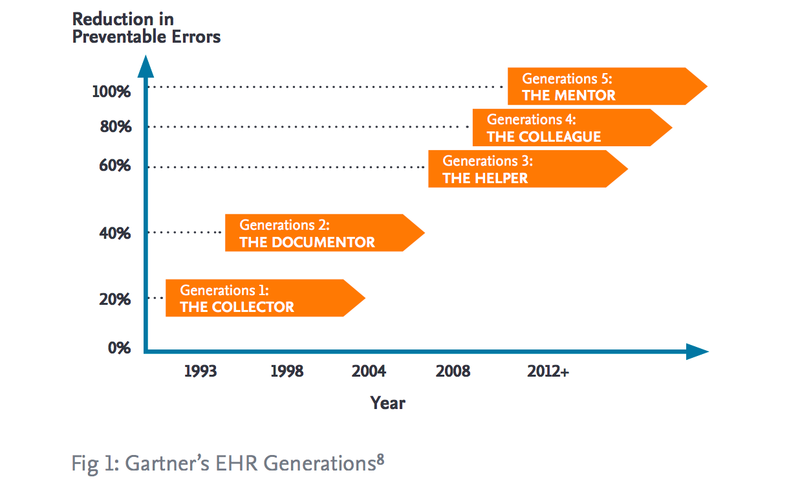 With the inclusion of CDSS, the EHR evolves from being a provider “colleague” to a “mentor,” with the power to cover the entire care continuum in guiding clinicians at all points of care. We are now seeing the evolution of the Sixth Generation EHR - “The Seer,” that has computable, standardised clinical data able to invoke clinical decision support from evidence-adaptive CDSS platforms. Although at present evidence-adaptive platforms require human intervention, we are now beginning to see the inclusion of artificial neural networks (deep learning), Bayesian networks, reinforcement learning, and other artificial intelligence techniques for synthesising evidence relevant to patient data in real-time, with potentially unprecedented insights for clinicians. Intelligence Augmentation (IA), where technology amplifies the decision-making capabilities of humans, has linked healthcare providers to vast amounts of patient data with relevant clinical knowledge, in real-time, at the point-of-care. We are likely to soon witness wide-scale proliferation of IA in Sixth Generation EHRs that incorporate evidence-adaptive CDSS. This kind of evidence-adaptive CDSS is at the heart of a Learning Health System (LHS)1, wherein evidence influences practice and the practice, in turn, generates evidence, creating self-propagating, virtuous cycles that bring about better, safer clinical care at optimal costs. There are six critical success factors (Table 1) for a CDSS, based on the ACUDIR model (Latin for “Come to the Rescue”), that can form the foundation of such a rapid LHS. CDSS solutions like Order Sets, Care Plans, and Clinical Pathways are a combination of evidence-based content and advanced technology platforms. The dilemma which healthcare organisations face today is whether they can “build” such advanced CDSS on their own or if they should “buy” proprietary CDSS products. 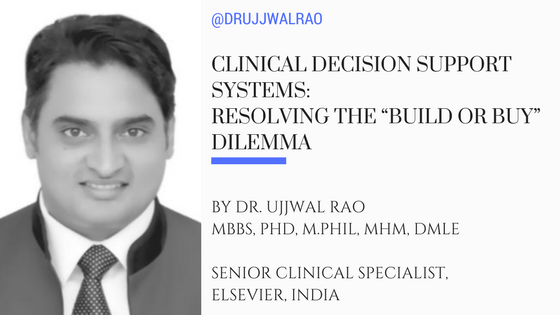 Dr. Ujjwal Rao is Senior Clinical Specialist in Integrated Decision Support Solutions, and is based in New Delhi, India. He provides strategic counsel to health providers on designing world-class clinical decision support systems with Elsevier’s comprehensive suite of current and evidence-based information solutions that can improve the quality and efficient delivery of healthcare. An experienced emergency physician, executive, clinical informaticist and technology evangelist, Dr. Rao has a decade of experience serving in trust and corporate hospitals in various roles ranging from clinical administration, hospital operations to quality & accreditation. In his former positions, Dr. Rao led EHR implementations for large hospital groups and designed bespoke healthcare analytic solutions to raise profitability. His passion to see transformation through technology led him to volunteer as a quality consultant with the United Nations. He also currently serves as an Assessor on the Panel of the Quality Council of India for the National Healthcare Accreditation Standards body, NABH. Dr. Rao obtained his degree in Medicine and then specialized in Hospital and Health Systems Management, Medical Law and Ethics before completing his PhD in Quality and Medical Informatics.